The rapid evolution and adoption of technology is opening new doors for credit unions at an unprecedented rate. As consumers connect, engage and relate to service providers in new, empowering ways, the potential for credit unions has never been more promising. 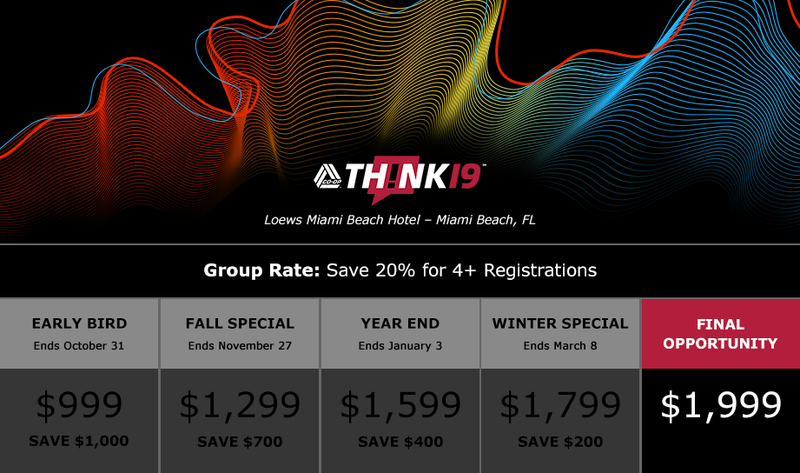 THINK 19 will show us how to determine our value proposition for the 21st Century, along with the keys to unlocking the strategic agility required to redefine the member experience today. We’ll discuss CO-OP’s latest initiatives to support you on your quest. And we’ll discover how the journey toward excellence can take on many different forms—along with how adopting a mindset of continuous transformation, in even the smallest actions, will be the key to ensuring our greatest success. You’ve heard the hype. Now is your opportunity to be part of the credit union industry’s most talked-about conference. Space for THINK 19 is limited, so be sure to register today to secure your spot early! Tell us a little about you, then click next to finalize your registration.